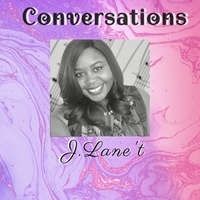 "Conversations" showcases J.Lane't's unforgettable voice, which gives you vibes of vintage Soul and R/B, with the warmth and comfort of Gospel music. The "J.Lane't" singing style and music has been said to be "gumbo gospel". It's an eclectic style that encompasses gospel, soul, opera, rhythm and blues with a hint of rock, but traditional gospel as it's foundation. The message of her music is never to be overshadowed by the style. In this album she embraces the many changes she faced both spiritually and emotionally. From her gospel songs like "Do You Hear Me?" to the soulful sounds of "You Got Me Trippin' ". This album will take you higher and have you dancing at the same time! She wants people to focus on the content, and not be bound by the "style" of gospel she is singing. Her unique voice and exciting melodies will keep you intrigued. Gospel is the good news of Jesus Christ and that's what J.Lane't is delivering!